Humans lived in South America at the height of the last ice age, thousands of years earlier than we thought, according to a controversial study. A team claims to have found 22,000-year-old stone tools at a site in Brazil, though other archaeologists are disputing the claim. Christelle Lahaye of Michel de Montaigne Bordeaux 3 University in France and colleagues excavated a rock shelter in north-east Brazil and found 113 stone tools. The team dated the sediments in which the tools were buried using a technique that determines when the sediments were last exposed to light. Some tools were buried 22,000 years ago – thousands of years earlier than any known human colonisation of the Americas. For decades, archaeologists thought that the Clovis people were the first to enter the Americas, 13,000 years ago. But since the 1980s evidence has accumulated for an earlier colonisation, at least 15,000 years ago. Could humans have been in Brazil 22,000 years ago? "The [dating] tests they present suggest they've got a good signal," says Ann Wintle at the University of Cambridge. For others, it is the tools that are raising eyebrows. "Rock shelters are difficult to interpret," points out John McNabb of the University of Southampton, UK. Stones falling from above can break, making them look like human-made tools. As a result, McNabb calls the evidence "suggestive but unproven". Lahaye says the falling-stone scenario is unlikely in this case: the tools are made of a rock not present at the site. "They come from at least 15 kilometres away," she says. Her group is studying tools from nearby sites, which she says show traces of having been used to cut wood and bone. 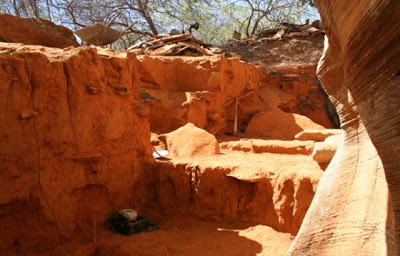 There have been many claims of an early human presence in South America, but none has proved conclusive, says Silvia Gonzalez of Liverpool John Moores University in the UK. She studied apparent ancient human footprints in Mexico, which turned out not to be footprints. "We seem to be going around in circles," she says. "Until someone finds a human skeleton, no one is going to believe this."